Tonight I had two hefe weizen, one a classic from Bavaria, and one an upstart from Connecticut. The classic is Ayinger Brauweisse, and I’d say it is indeed a classic, brewed in accordance with the beer purity law, so the subtle fruitiness and the subtle spice come from the hops and not from any other source. As a wheat beer, there’s a certain bready chewiness to it, and a stick to the ribs aspect, but it’s heft is belied by its ABV, only 5.1%. 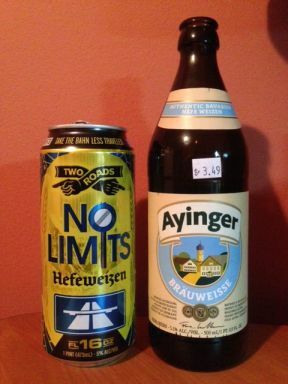 The upstart is from Two Roads, their No Limits Hefeweizen. The can says “Take the Bahn Less Traveled.” Everything about it is a bit less subtle than the Ayinger. It’s a bit fruitier, a bit spicier, and a bit crisper. It is less chewy and it’s lighter, though only a tiny bit in ABV, 5%. I confess that I prefer the Two Roads, but the purist and the traditionalist will prefer the Ayinger.